Two NCOs from the 412th Logistics Readiness Squadron and members of an Army Blackhawk crew assisted in preparing the helicopter for transport. EDWARDS AIR FORCE BASE, Calif. — Two 412th Logistics Readiness Squadron Airmen assisted in transporting an Army National Guard Blackhawk helicopter from Barstow-Dagget Airport in San Bernadino County to the East Coast Aug. 28-29. The UH-60 was one of two Blackhawks being used by the 224th Aviation Battalion of the Maryland National Guard who were conducting their annual two-week training, which happened to be here in California. 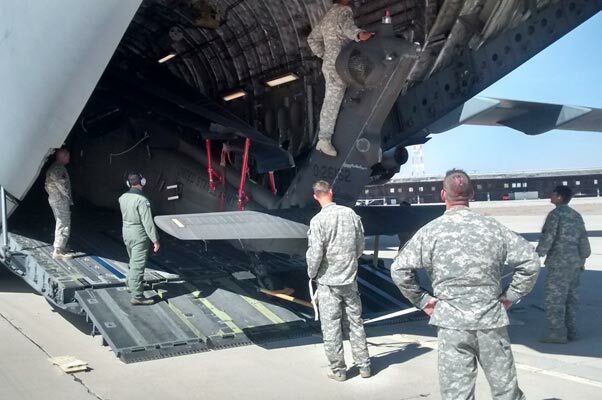 Transporting the Blackhawk by C-17 is the quickest and least expensive method of moving it cross-country. Flying the helicopter would require multiple fuel and maintenance stops. Also, flying at such low altitudes over a span of several days would put great strain on the aircraft. When it came to transporting the chopper, the Army came up against “a slew of regulations and standards” in place for safety when loading cargo aircraft via military air. For instance, hazardous materials must be accounted for and documented, cargo must be weighed and vehicles must have a weight and center-of-balance for marking. The 412th LRS and installation deployment officer were asked to help with inspecting the helicopter and accompanying crew and cargo for airworthiness, load planning and supervising the loading operations. 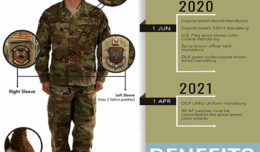 The request came from the Maryland National Guard unit’s leadership through the Air National Guard’s 175th Wing in Martinsburg, West Virginia, who owns the C-17. That’s where Staff Sgt. Andrew Chilcoat and Staff Sgt. Johnathan Barnes came in. 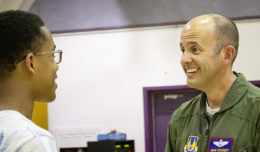 They’re the only two Air Trans career field Airmen on Edwards AFB, also known as porters. Barnes works in the 412th LRS Traffic Management Office processing cargo for ground transport. As Installation Air Transportation manager, Chilcoat is the unit deployment manager, health monitor, fitness program manager, alternate equipment custodian, and he schedules air travel for deploying personnel. “We had to accomplish this task, which normally is done by an entire flight, by ourselves,” said Chilcoat. The team loaded one UH-60 Blackhawk helicopter, its crew of 11 personnel and basic maintenance equipment, into the C-17 for transport. After landing in Martinsburg, the cargo was moved to its final destination in Edgewood, Maryland. The total cargo weight, including passengers for the Blackhawk transport was 17,270 pounds. According to Chilcoat, the 412th LRS only recently started supporting this type of operation when they loaded delicate instruments on the Stratospheric Observatory for Infrared Astronomy (SOFIA) used by NASA’s Armstrong Research Center at Edwards. “Staff Sgt. Barnes and I are very eager to continue and expand these operations as they give us valuable experience in our career field,” said Chilcoat. The porters are responsible for ensuring that all cargo and passengers are ready to load, while the loadmasters are the technical experts on the airframe and the final authority on what goes on the aircraft and how it goes on. They are part of the aircrew and fly with the cargo. Porters, like Chilcoat and Barnes, build cargo on pallets, manifest and load plan cargo, inspect hazmat, manifest and screen passengers, load cargo and passengers, and even stock aircraft with passenger comfort items and service aircraft latrines. They are also responsible for securing cargo to the aircraft floor using chains and straps.